Époisses de Bourgogne is a cheese made in the village Époisses, which is in the département of Côte-d'Or in France. It is located around halfway between Dijon and Auxerre. Commonly referred to as Époisses, it is a pungent unpasteurized cows-milk cheese. 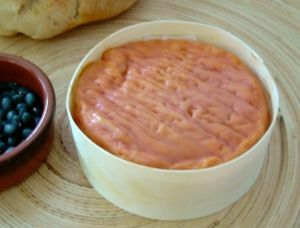 Smear-ripened, it is circular at around either 10 centimetres or 18 centimetres in diameter, with a distinctive soft red-orange colour. It is sold in a circular wooden box, and is often served with Trappist beer or even Sauternes rather than a red wine. Napoleon was a particular fan of the cheese, and the famous epicure Brillat-Savarin himself classed it as the "king of all cheeses". At the first stage of manufacture, the whole milk is heated to around 30 °C with the coagulation lasting for at least 16 hours. The fragile curds are drained in moulds, and the whey then allowed to run off. Around 48 hours later the cheese is removed, salted, and placed on racks to dry; once dry, it is moved to cellars to mature. Each cheese is rinsed up to three times per week in a mixture of water and marc, and brushed by hand to spread the bacteria evenly over the surface. The yeast and fermenting agents produce the distinctive orange-red exterior, as it develops over a period of around six weeks. The milk's coagulation must be performed by lactic acid and continue for 16 hours. The curd must be cut roughly as opposed to being broken. After drainage, only dry salt may be used.